More and more things about the upcoming HTC One (M9), codenamed Hima, are starting to leak. This time around we're hearing that despite what some previously leaked pictures have shown us, the device won't be almost identical in terms of design to its predecessor, the One (M8). Hence, the M9 is rumored to come with an edge to edge glass panel on its front. The speaker panels will no longer be exposed like they were in the original One and the One (M8). Rather, they will be enclosed within the aforementioned glass. This will get two 45 degree cutouts for the slit speaker grills, which will span around 50% of the handset's top and bottom edges. The black bar which rested under the screen in the One (M8) and housed the HTC logo will be gone from its successor, to the relief of many. This will happen because HTC made the plastic speaker panels, which are used to cover the speakers and amplifier, taller in the Hima. This means there's no need for that infamous black bar anymore, so it will be gone. No matter how good all of this sounds, don't forget to keep in mind that we're only talking about a rumor for now and none of these details have been confirmed yet. 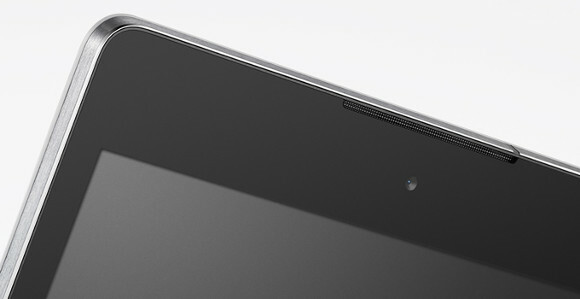 The Nexus 9 speakers were their first time doing that style, and they were on par with the M7, maybe even the M8. So I wouldn't worry too much. The grills were for aesthetic only, they didn't need massive speakers. I almost never use headphones other than music while working. A majority of my videos are from my speakers, and sometimes I just use speakers for music, too. I rarely have headphones with me.